The first day of September is rich with meaning for so many people in so many ways. For students of every age, from Pre-K (something that hadn’t even been invented in my day) right on through doctoral studies, it marks the time when attention turns from the delights of summer to demands of learning; for those of us in New York, it signals the start of another year’s rich smorgasbord of cultural delights – from ballet to Broadway; and, of course, if, like me, you hail from Alabama or some other state where football takes the ascendant over pretty much everything else, it’s time to Roll some Tide! But, September 1st is also, for Miriam, Mary B. and me, the day Mama died. It’s hard to believe it’s been forty-two years already since that day in 1973, (you can find my long-form essay on the subject, “THE DRAGONFLY,” here: https://inpraiseofangels.wordpress.com/2014/11/02/the-dragonfly/ ) but she didn’t leave us empty-handed, and her legacy has proven more resilient than even I might have imagined. So even as I look forward to a new fall season, it is good to pause and give thanks for the many gifts she gave to us, and, in truth, brought with charm and grace to every new place the Wilson family ever lived. One of these was Decatur, AL, where we lived from April 1967 to August 1969. Located on the south bank of the Tennessee River where it reaches its deepest point on the map, Decatur was abustle with all sorts of enterprise when we moved into our new house on Greenwood Drive. There were new factories being built in every direction, the space industry in Huntsville, only 20 miles away, was growing by leaps and bounds, and as a result, the city was truly awash in those days with newcomers. We were everywhere. From the Decatur Daily, sometime in 1967. Mama grew the flowers in the yard, and just for the record, they may be melon balls on the plate, but they didn’t come from the bowl of frosted grapes (a Jane Wilson specialty) sitting nearby. 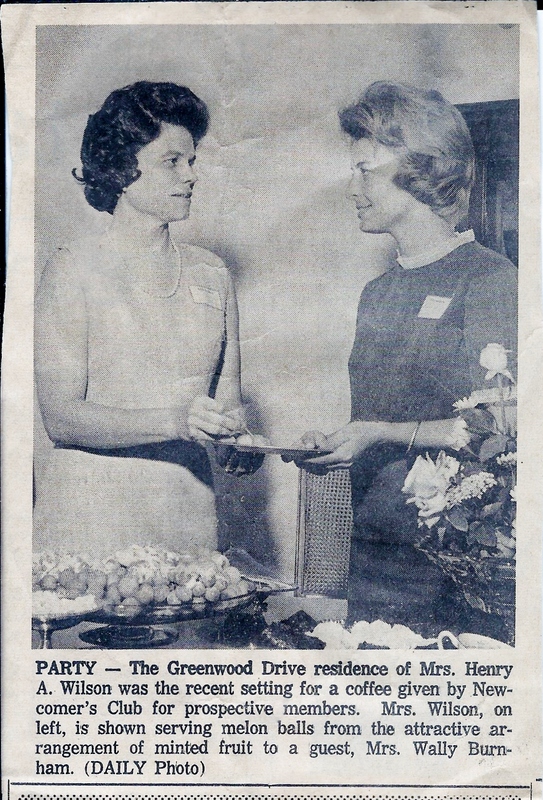 But, of course, being a newcomer is, by definition, a short-lived distinction, so it wasn’t long before Mama was making arrangements with our new neighbors to have a similar monthly gathering – only this time a luncheon – that would include all the women who populated our cul-de-sac. It was a good bet that most of them were newly arrived and amenable to the idea since the land we were all living on in our newly built, brick veneer, two-story houses had been a cornfield only a year or two before. It was no surprise to any of us that Mama’s new luncheon club was a big success from the very first. And, so, with a holiday weekend looming – barbecues at the ready – and many family gatherings in the offing, I thought this might be the perfect time to both remember Mama on this anniversary as well as to honor her generosity of spirit with everyone – newcomers, late bloomers, and especially the unloved and unlovely – by sharing this recipe. It is a great refrigerated option for a warm end-of-summer day, though sinfully rich. But don’t let that stop you! You’ll be a hero to every would-be child in your family. And, just for what it’s worth to that small percentage of my readers who are Bama fans: It’s a crimson and white concoction! NOTE: What you need to know right up front is that this can be the easiest dessert you ever made if you’re willing to make it according to the original recipe, which uses Dream Whip topping and canned cherry pie filling. It will work almost as well that way, and most people might not even notice the difference, but I just couldn’t do it, so have substituted real whipped cream for the Dream Whip and made my own cherry topping from fresh cherries, which is truly a luscious thing! Also, this is a layered recipe, so I’m going to write it one layer at a time, starting at the bottom, to make it easier to follow. Bake for 5 minutes in pre-heated 350° oven to set. Turn off oven. Let crust cool. Place cheese and sugar into bowl of electric mixer and using blade attachment blend thoroughly until completely smooth. Carefully spread mixture over crust layer. Sprinkle chopped nuts over the cheese layer as evenly as possible. Refrigerate to set while making next layer. Whip cream with whisk attachment of electric mixer. Begin at medium speed and when frothy, add sugar and vanilla a bit at a time. Move to high speed until whipped just a bit more than you regularly would to give it stronger body resembling Dream Whip (to hold up the cherries). Remove dish from refrigerator and carefully layer whipped cream on top of pecans. Return to refrigerator while making next layer. Put cherries with nothing else into heavy sauce pan and place, covered, on medium heat for a few minutes (about 15), stirring frequently, until the fruit releases it’s juices. Meanwhile, place dry ingredients in a small bowl and whisk together to combine thoroughly before adding to the cherries. Pour into hot cherries and return to stove, over low heat this time, and bring to a boil. Simmer for a couple of minutes until the mixture has thickened. Remove from heat. Let cool completely. (You don’t want to put warm cherries on cold whipped cream or it might collapse). Once completely cooled, carefully spoon cherries over desert and even out to cover completely. Refrigerate for at least four hours before serving. Bask in compliments. Another note: It has also occurred to me that it might make more sense to put the cherries in after the pecans and then cover with the whipped cream on top. But then, of course, you’d be left with just a white dish without much eye appeal. 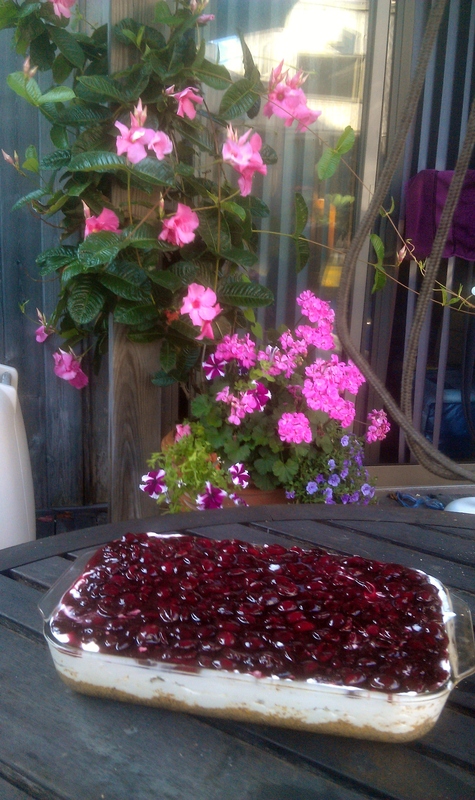 That’s why I think the next time I do it, I might just leave out the whipped cream layer entirely and then, when serving, place a dollop of whipped cream on top of plated squares of cherries over the cheese filling. Just a thought. From Mama’s kitchen, and mine, to yours! Have a wonderful holiday, wherever you are, and don’t forget to thank your angels every chance you get! © 2015 George Thomas Wilson. All rights reserved. This entry was posted in Angels, belief, cooking, Death, desserts, faith, fruit glaze, Holy Spirit, Love, prayer, recipes, religion, Uncategorized and tagged cherries, Cherry dessert, cherry pie filling, Decatur, Decatur Daily, Huntsville, Newcomers Club, refrigerated desserts, rich desserts, sinful desserts. Bookmark the permalink.